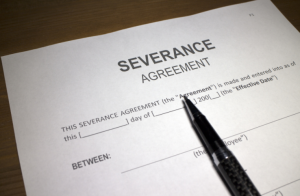 The Los Angeles Severance Review And Negotiations Employment Lawyers at Azadian Law Group, PC have helped many employers and executives with negotiating more favorable severance agreements. Many employers see the benefit of providing severance to executives and employees in order to obtain a release of the employee’s potential claims against the employer. These negotiations can sometimes become contentious when the employer does not offer fair value in the form of severance or insists on unusual terms that could hurt the executive in the future. The Los Angeles employment lawyers at Azadian Law Group, PC have reviewed hundreds of severance and general release agreements and can advise if anything is out of the usual. Our employment lawyers also regularly assist clients in negotiating more favorable terms, including increased compensation, continuation of benefits (including COBRA payments), and neutral to favorable references for future prospective employers. Having represented top-level executives, including Chief Executive Officers (CEO), Chief Financial Officers (CFO), Chief Operating Officers (COO), Managing Directors, and Vice Presidents of numerous private and non-profit employers, our employment lawyers have the skill to ensure you receive the most effective and reasonable advice. We understand that your future is very important to you and make sure to approach the entire situation with that in mind. Many times, our lawyers find it effective to “ghost-write” proposals for our clients to send and assist “behind the scenes” in the negotiation process. Other times, it is more beneficial for us to reveal ourselves and negotiate directly with the employer’s counsel. These are consideration that we discuss with you and evaluate carefully based on your current situation. Based on our experience litigating hundreds of employment cases, we know how to identify if you have leverage that may be useful in negotiating a more favorable confidential settlement. If you would like a severance or release agreement reviewed by a skilled employment lawyer or help seeking more favorable terms for your departure, contact us for a free initial consultation. Depending on the situation, we have numerous fee arrangements that may meet your needs.